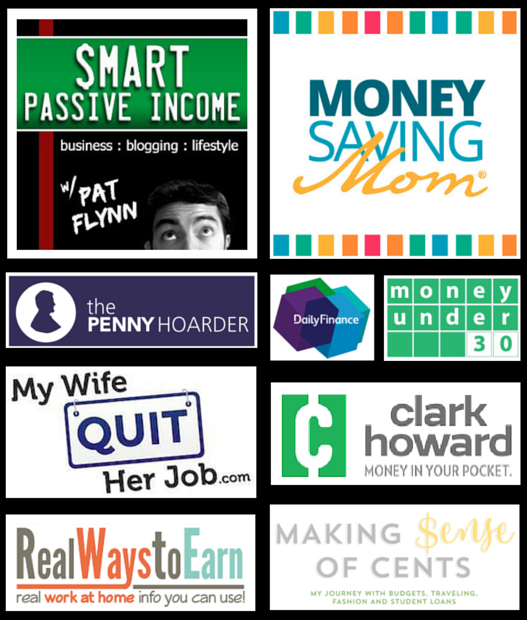 If you’re just getting started with your Amazon FBA business (or have even been selling for a long time) you may have noticed that we are an acronym loving bunch. We have acronyms for almost everything. It can become confusing and cause you to feel overwhelmed if you don’t know what these letters mean, but that’s where this list will help you. Heck, we’ve already used an acronym in this first paragraph. But, hopefully you know what FBA means at this point 🙂 If not, it’s on the list below and after reading this post, you will be good to go, knowing all the lingo. First, let’s talk about what an acronym is. An acronym is a group of letters based on words that stand for something and usually identifies technology, products, groups and also organizations. Acronyms make it easy to type out common used words without having to spell them out completely. Sort of like shorthand. And, it's not just acronyms we use, there are a lot of terms that are unique to Amazon sellers that may go right over your head if you haven't seen them anywhere before. For FBA Sellers, you may have seen these acronyms used in Facebook Groups or on blogs like the one you are reading now. 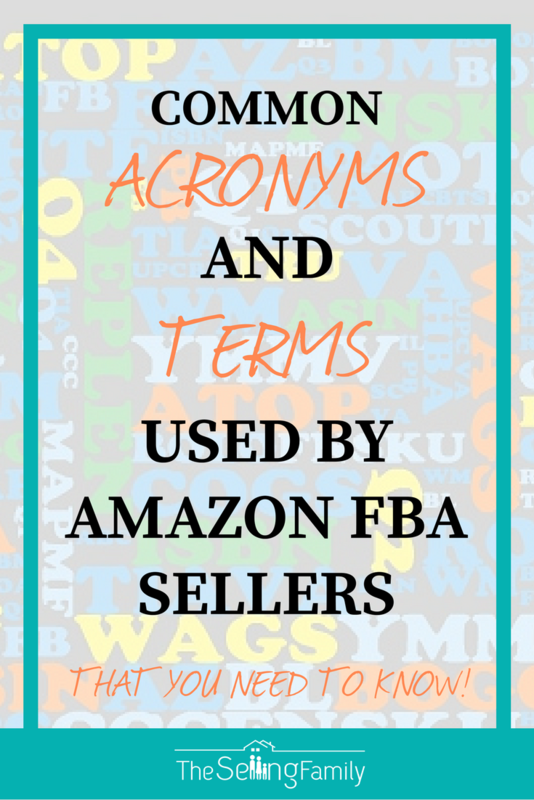 Alright, let’s go over these commonly used Acronyms by Amazon FBA sellers. This list will definitely come in handy as you grow in your business. Grab A Printable Version Of This List! 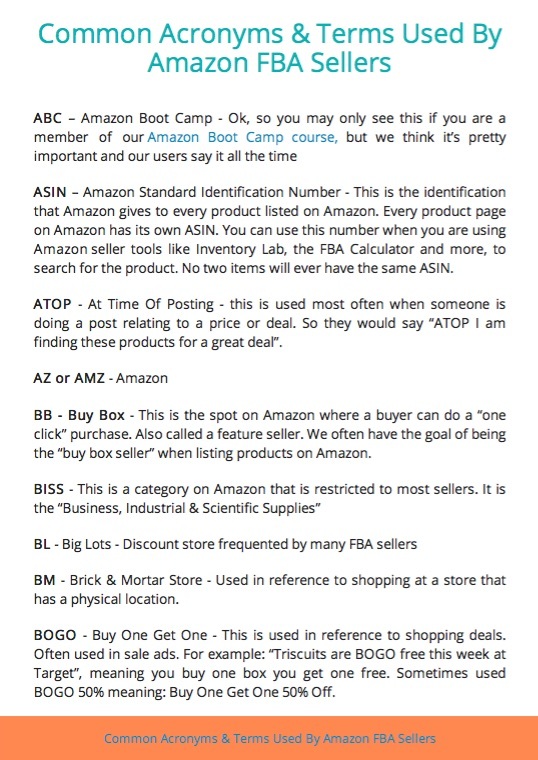 Join our mailing list and we will send you a PDF version of this list of common acronyms and terms used by Amazon sellers. You have been successfully subscribed. Please check your email for the PDF. ASIN – Amazon Standard Identification Number - This is the identification that Amazon gives to every product listed on Amazon. Every product page on Amazon has its own ASIN. You can use this number when you are using Amazon seller tools like Inventory Lab, the FBA Calculator and more, to search for the product. No two items will ever have the same ASIN. ATOP - At Time Of Posting - this is used most often when someone is doing a post relating to a price or deal. So they would say “ATOP I am finding these products for a great deal”. BB - Buy Box - This is the spot on Amazon where a buyer can do a “one click” purchase. Also called a feature seller. We often have the goal of being the “buy box seller” when listing products on Amazon. BM - Brick & Mortar Store - Used in reference to shopping at a store that has a physical location. BOGO - Buy One Get One - This is used in reference to shopping deals. Often used in sale ads. For example: “Triscuits are BOGO free this week at Target”, meaning you buy one box you get one free. Sometimes used BOGO 50% meaning: Buy One Get One 50% Off. BOLO - Be On Look Out - These are products that one Amazon seller has found to be profitable and they are saying “BOLO for this item, it will make you money”. Brand Registry - A program Amazon has created for sellers to protect their brand from copyright and/or trademark violation. BSR - Amazon's Best Sellers Ranking - This is the rank that Amazon gives products based on their sales volume. Each category has its own ranking. BTS - Back To School - a season where Amazon sellers often buy products from retail stores and mark them up on Amazon. See our Back To School Training here. Bundle - When a listing on Amazon combines multiple DIFFERENT products together, to create ONE new product listing. Category - The placement within Amazon to categorize products. There are main categories as well as sub-categories. Some categories are restricted to new sellers and others are open to all sellers. CCC - CamelCamelCamel.com - A great site where you can see the price and rank history of a product when doing Online Sourcing. CDN$ - Canadian Dollar - this comes into play if you are selling on the Amazon.ca platform. COGS - Cost Of Goods Sold - The price that you paid for your inventory items. Used for tax purposes and accounting purposes. EAN – European Article Number - If you sell in Europe on the European network your products will be assigned a 13 digit code called a European Article Number or International Article Number, IAN by some people. FC - Fulfillment Center - A fulfillment center is where your products are sent to if you are using the FBA products. This is where they are stored and then prepped and shipped once they are sold. FBA – Fulfillment by Amazon - This means that the seller has shipped their inventory to Amazon to pick, pack and ship for them. It’s one of the best ways to make more money with your inventory because FBA sellers can take advantage of free shipping and even have the ability to list their own new items if they are a professional seller. FNSKU – Fulfillment Network Stock Keeping Unit - These are the numbers printed directly on your product labels to enable the picker’s scanners to identify this product as yours so that the correct item is pulled for each sale. Your units will always have a unique to you FNSKU, so if a piece of your inventory was to get misplaced, the FNSKU would link it back to you. Fulfillment Fee – The cost Amazon charges sellers to pick, pack, and ship products that are sold through the FBA program. GC - Gift Card - Many Amazon sellers will buy discounted gift cards to purchase inventory, especially for online arbitrage. HBA - Health & Beauty Aids - One of our favorite niches on Amazon. This could be part of either the beauty category or the health and personal care categories. HTF - Hard To Find - When a product becomes hard to find, the price often increases on Amazon.com. IL - Inventory Lab - The only service we recommend for inventory management and listing on Amazon. Inventory - The products that you have available for sale on Amazon. ISBN – International Standard Book Number - You’re probably familiar already with this acronym since it’s on every print book you’ve ever purchased. For us Amazon sellers, the ISBN is used in the same way that UPC codes are used: looking up products, using with seller tools, and has to be covered when sending items to Amazon. Keepa - A site similar to CCC where we can see the price and rank history for most items listed on Amazon. This is helpful in making buying decisions. They even have a chrome extension that makes it easier to use! MAP – Minimum Advertised Price - This comes to you when you have a type of product with restrictions that the manufacture placed on it not allowing your advertised pricing to go below a certain number. You will find this when dealing with wholesalers or buying direct from a manufacturer. MF or FBM – Merchant Fulfill - This is not a dirty term. This means that the item is being fulfilled by the merchant. If you are a MF seller, you’re filling the orders yourself, picking, packing and shipping straight to the customer on your own. Some people use FBM since it looks nicer. MOQ – Minimum Order Quantity - This is the minimum # of units that can be purchased at a time. This is often seen when you are buying from wholesalers or creating a private label product. MSRP – Manufacturers Suggested Retail Price - This is the price that the manufacturer suggests their products be sold for. On Amazon you will find the MSRP shown above the selling price, IF, the current price is lower than the MSRP. Multi-pack - When a listing on Amazon includes multiples of the SAME product and they are then sold as one unit. Net Profit - The amount of profit you have left in your business after taking out all operating expenses, including cost of goods and Amazon fees. OTC - Over The Counter - When you are selling HBA items you want to make sure they are OTC and never prescription! # - PK - When a listing on Amazon comes with multiple's of an individual product. Example a 3PK of toothpaste would come with three tubes in a single purchase. This is often referred to as a multi-pack as well. PL or WL - Private Label or White Label - This is when you create and brand your own product, usually buying directly from the manufacturer in China. PPC - Pay Per Click Advertising. This is when you run an add for a product on Amazon (often done by private label sellers) and you are paying by the click to your listing. Pro Merchant - This is when you have the “Professional Seller” account on Amazon that costs $39.99 a month. This makes it so you can use 3rd party software (like paid scanning apps) and you also save $.99 in fees per item you sell on Amazon. If you are selling more than 40 items per month, then you actually SAVE money by being a Pro Merchant. Here is a breakdown of the differences between the Pro Merchant and Individual Account. Q4 - 4th Quarter Of The Year - October - December - The BIGGEST sales quarter of the year! Where we often make up more than a 3rd of our yearly income. Many sellers ONLY sell during this time. Check out Q4 Profits for the inside scoop. RA - Retail Arbitrage - Buying products locally from retail stores to sell online. This is the method that we teach in our Amazon Boot Camp. Get the full scoop on how retail arbitrage works here. Replen - Replenishable Item - A product that you purchase for regular or sale price that can be purchased again and again to sell online. ROI - Return On Investment - How much money you make on your sold items. SEO - Search Engine Optimization - When you are creating listings on Amazon, it is important to remember search terms so that your product will rank on Amazon (and even Google) and buyers can find the listing. SC - Seller Central - Your main dashboard when logged into your Amazon Seller Account. Scanning - What we are doing when using an app on our phone to check prices in store against the prices for the same item on Amazon. Scoutify - One of the main 3rd party scanning apps available to Amazon sellers. Scouting - Looking for products to resell online. TIA - Thanks In Advance - Often used in groups when someone is asking a question. They will ask it and end with TIA, as to say thank you for any answers you may provide. TRU - Toys R Us - Retail store frequented by many Amazon FBA Sellers, especially in Q4. VA - Virtual Assistant - Often referring to someone who helps you find products online that you can resell on Amazon. UPC - Universal Product Code - A barcode with 12 digits that can be found on almost all products found in the retail world. You can use the UPC code to look up items on Amazon. This is also what is covered up by your FNSKU label when preparing your products to send in to FBA. Wags - Walgreens - Drug Store often frequented by Amazon sellers. Wholesale - This is a business model where you are buying directly from the brand owner and then reselling the product on Amazon. Many times you can get the product for 30%-50% off the retail price. WM - Walmart - Retail store often frequented by Amazon Sellers. YMMV - Your Mileage May Vary - Often used when talking about unadvertised deals / clearance. Meaning that just because one person was able to get it / do it, doesn’t mean it will work for you too. Have you ever felt left out because you didn’t know what an acronym meant? Did we miss any that you have heard before? Jessica l am very grateful to join the selling family. In fact, this information will prepare me to start on a good note. Estimators and rank. Thanks for everything you do Jessica. My daughter gave me your course as a gift and I’m very grateful to her. I’d like to use this to supplement my retirement. QUESTION: I’m still confused about the term rank and estimator when used together. First, is a high rank number good or bad. I’m used to thinking that #1 is “top dog”. Or would 20,ooo be top dog? So when I look at the estimator, how do I use this information to evaluate products? FB is not facebook when it comes to amazon. You’re welcome. You are right! I need to add it. So much to learn but these little nuggets of wisdom are invaluable! Thanks for the list of acronym! Don, 3-pk means “3 pack”…comes in a pack of three of the product. Hi Mike, this is minimum order quantity. The lowest amount that you can buy from a specific supplier. I’m guessing it means “3 pack”. Where each package contains 3 separate items. 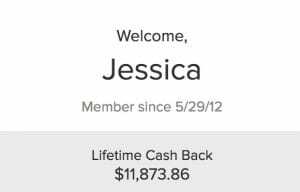 Jessica, I am a newbie, just getting starting in building my business. I currently gathering all of the information you have provided. It’s awesome and easy to understand. I will be investing in you bootcamp. Thank you for your willingness to share. Thank you so much for providing this data. Without knowing you can get easily confused. Thank you for this list! I am a newbie, just got into ABC and I’m looking forward to learning more from you! Im still a little confused about the ASIN number. If you have the same product and list under that category which a seller has same product, do you get your own ASIN number or the same one? The ASIN is specific to the product page on Amazon, and not to the seller. You “list” on ASINS and your products are identified with the FNSKU labels you put on them. This is a vital list of lingo, Selling Family. Thank you for helping us learn the language of Amazon FBA. We so look forward to getting our business up and running! Hi, this has been added to the list. I’ve spent the last 2 months trying to figure all this Lingo out on my own. I could have learned it in 1 minute on here!! And yes! Often felt left for not knowing and asking the questions. I’m so grateful for you and your family. I’ve researched so many You Tube videos\trainers and yours was the only one that seemed genuine. I honestly feel like I can make a change for the better for my family. Thank you SO much for this list, I personally hate acronyms, mostly because there are so many I don’t know what they mean. Then I feel dumb when I have to ask, like I should know, but I don’t. This is a common feeling. Thanks for this wonderful list. Very useful. Jessica, am I the only person in the world who doesn’t know the acronym SEO means? I’m sure you aren’t 🙂 This has been added. OMG, this is great. For I am a Newbie. Looking forward to learning more with The selling family. Thx Jessica. Thank you for this list. I did print it out and will keep it by my computer. This is a great resource. Especially for a possible newbie to the FBA scene. I appreciate you The Selling Family already and this is only my second time receiving an email from you. Thanks much. Thanks Jessica for the list of acronyms! Will you be going over the PPC? I have seen PZP as well and I’m not quite sure as to what it means. Could this be Prime Zero Prep, for prep & logistics outsourcing? Thanks Jessica for this eye-opening list. Thanks very much for this list, it will become one of my most used resources because keeping track of the acronyms can be overwhelming. We always look forward to your valuable posts. Just wanted to clarify that the ASIN number is attached to the listing, not the product itself. Although a specific product is only supposed to be listed once, as we all know and despite Amazon’s rules, the same product can be listed multiple times. Each one of these listings has a separate ASIN. Hey Josie, yes this is correct. Thanks for clarifying.